Ihr wollt die Geschichte lieber auf Deutsch lesen? Hier entlang! 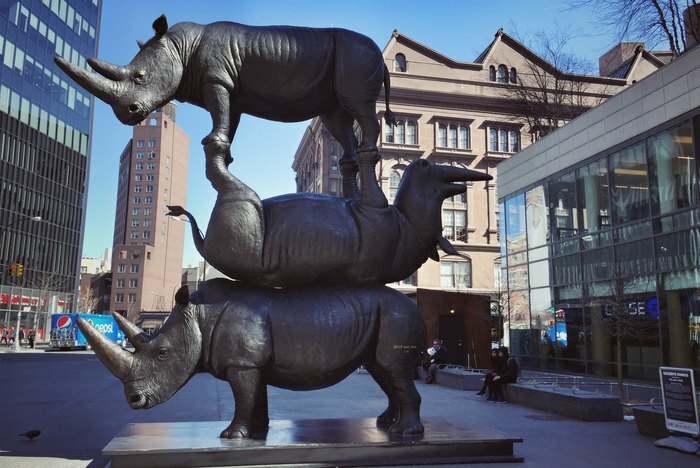 There is a stack of rhinos in Astor Place, and I could have studied the accompanying signs and the artists’ website and then written this piece. 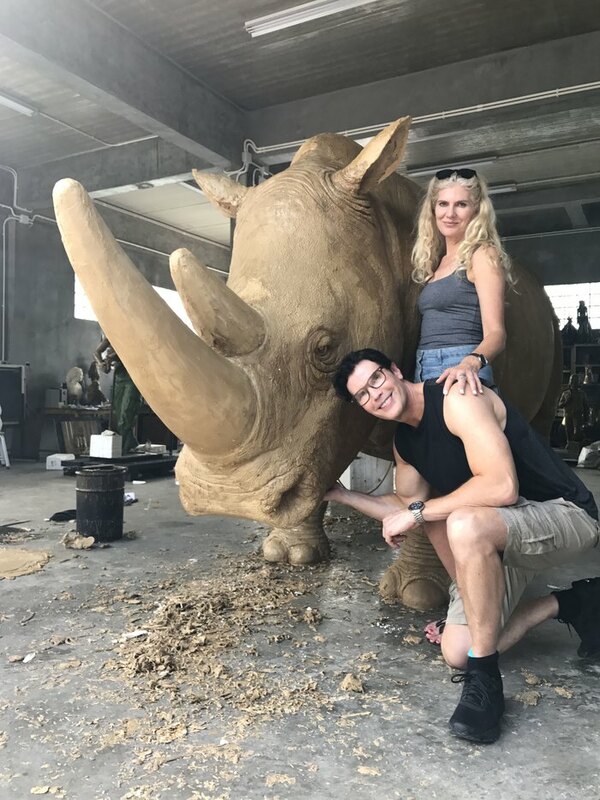 Something about the three Northern White Rhinos portrayed in “The Last Three” by an artist couple who go by their first names, Gillie and Marc. 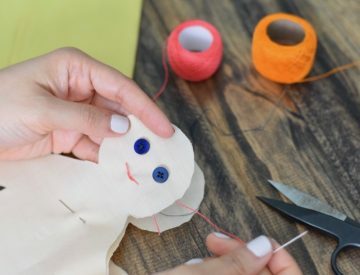 But I had questions that those materials didn’t broach. 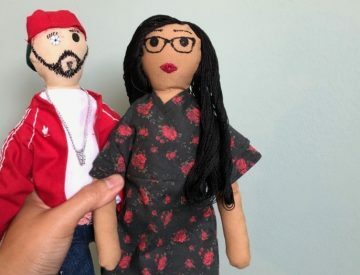 So I reached out to the artists and asked for an interview. Alas, Gillie and Marc had already left New York. But they agreed to answer a few questions via e-mail. Thus, I will deviate from my interview series – which requires the flow of a real conversation – and present the artists, their mission and their view on New York as well as on activism in a profile sprinkled with quotes. And rhinos, of course. 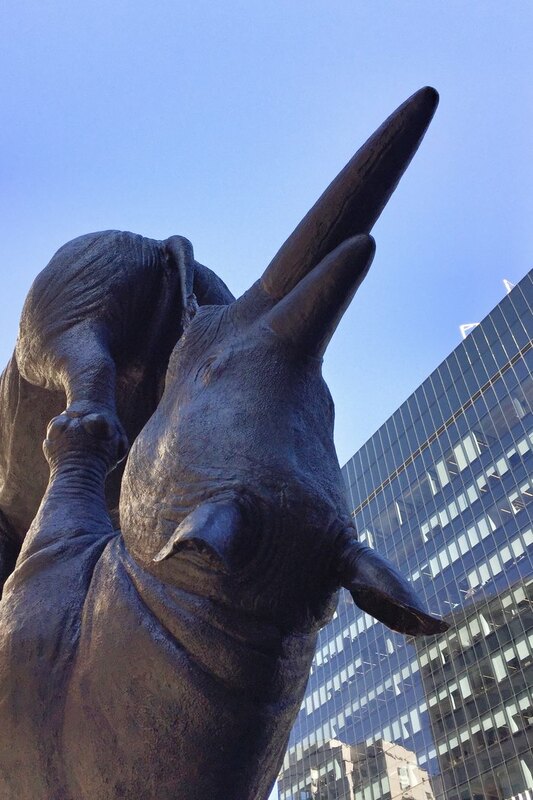 Even a real rhino, not a bronze. It’s not easy to get a hold on Gillie and Marc Schattner. They seem to be all over the place, leaving a trace of sculptures wherever they went. In New York, a bunch of dog-headed bronzes aiming cameras at passersby met their smartphone-wielding counterparts last year, spreading over social media, before the physical world versions disappeared. That had been scheduled. Five years ago, in Sydney, a different set of dogs made from fiberglass were mostly stolen. Maybe their title “Lost Dogs” had been sending an unintended message. Wildlife poaching is at the center of “The Last Three”. Rhinos have been around for millions of years in Africa, and the large amount of vegetation they eat in order to sustain their massive bodies on a vegetarian diet is an important factor for balance in their natural environment. But rhinos are hunted for their horns, either by international trophy hunters or to support a business based on the (mostly Asian) belief in rhino horns’ medicinal and aphrodisiac power. The demand is so great that poaching has endangered several kinds of rhinos. The three animals the sculpture depicts are Northern White Rhinos – and the last of their kind. They live a protected life – with 24-hour armed guards – on a sanctuary in Kenya, but they cannot breed anymore. Gillie and Marc Schattner have been following the fate of several kinds of rhinos in Africa for a couple of years. In 2017, they got a chance to meet the Northern White Rhinos called Sudan, Najin and Fatu, and they are still swooning over how they spent a week as close to the animals as possible, hugging and tickling them every so often. Immediately, my brain creates images of a rhino petting zoo (see? I can imagine things visually, too! ), and it turns out that isn’t too far off. The artists see an even bigger picture – and they go as far as promoting a travel company that offers trips to see the last Northern Rhinos in Kenya. Booking with them is one of several suggestions on how to help on their “Goodbye Rhinos” website. 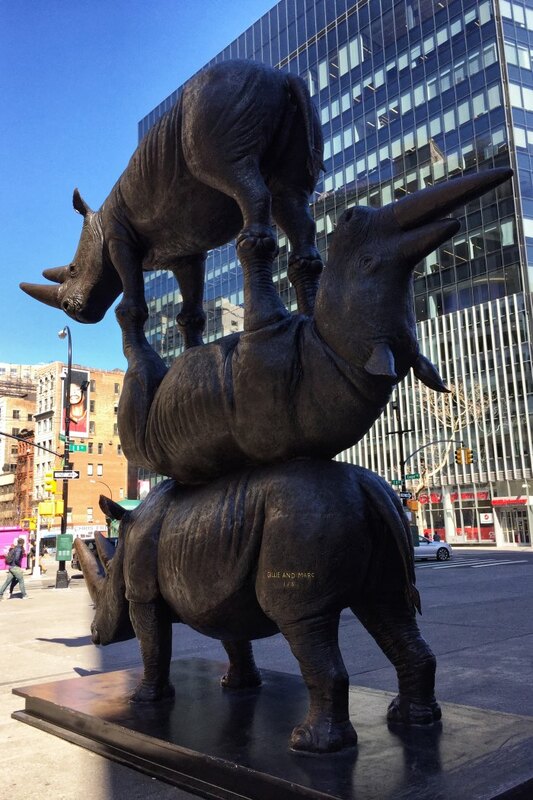 Instead of some place in Africa or Asia, Gillie and Marc chose New York as the first location to place their sculpture of Sudan, Najin and Fatu. 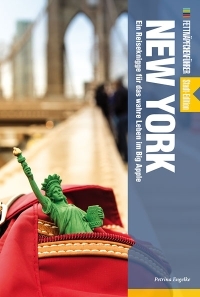 Because New York, to them, is an art hub that creates global trends and discussions. However, that also makes it harder to cut through the noise. 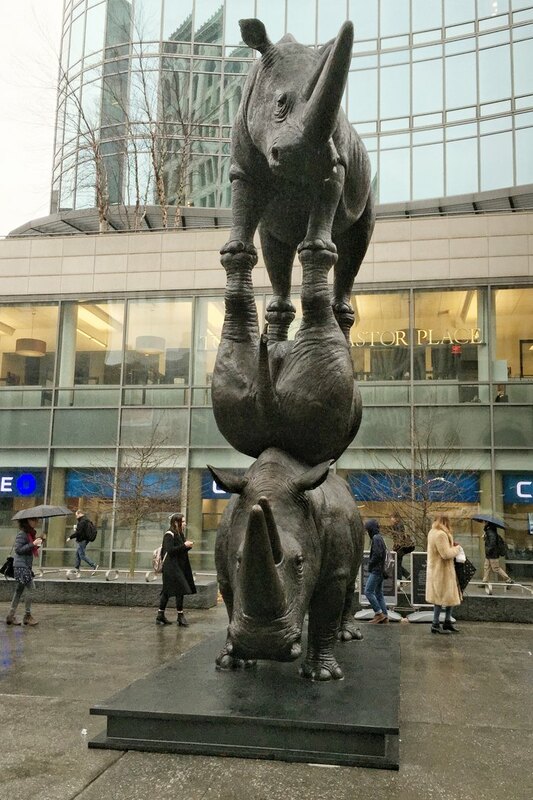 And this is why Gillie and Marc Schattner stacked rhinos in Astor Place: “We decided to stack the rhinos on the one hand for visibility. We wanted the sculpture to be unique and eye-catching, in order to draw more attention to the cause”, they write. In the same breath, they link their eye-catcher’s design to a deeper thought. They both work as artists full time nowadays, using their experience in graphic design (Gillie) and from a career in advertisement (Marc) for the cause. For instance, their Kickstarter campaign for “The Last Three” brought them 54,015 Australian Dollars and a lot of attention. They call “The Last Three” a campaign, with a website full of calls to action, a hashtag, an app, and more sculptures in other cities to follow. 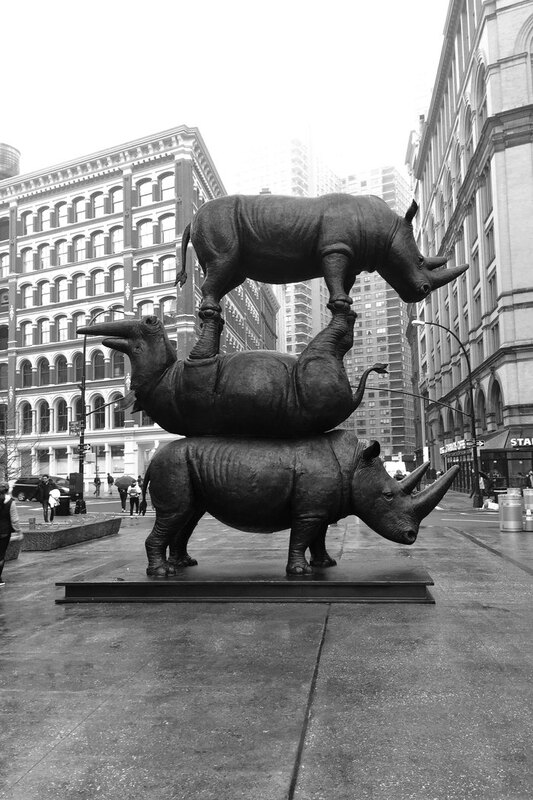 A few days after their sculpture was installed on Astor Place, one of the rhinos died. It was Sudan, the last male Northern White Rhinoceros, with whom the artists had cuddled not too long ago. You like the way I write, but you can’t read German? Click here to find more interviews in English.